One of the things I have chosen to do as a part of the overall experiance of recreating the past is to handsew the garb, for some people this seems like complete madness, for me it’s kind of a mix between the possibilities to do two things at the same time (sewing and watching movies, or chatting with other people), it looks very nice and period and I don’t have to worry about showing other people modern stitches, I don’t like the sound of the sewing machine (…and I do think that it sometimes just is pure evil and will not work just to piss me off), and I do actually love to sew! The journey is kind of as important than the goal …so to say. Lately there has been a lot of curious people asking me about it, and it made me realize that just to say “It’s sooo easy, just do it!” is kind of like handing someone a sewing machine and say “just thread it and it will be so fast!” …but their is some basic knowing you do need that will make it easier. If you never have thread a machine, then you proabaly need someone to show you how to get started, and if you never have done handsewing before, then you need some basic tip and tricks that will make the sewing fun rather then challanging. Handsewing is kind of like buying linen: it’s different weight and colours and prize classes that you need to know about before buying the fabric you need for your garb. 1) I prefer to use linen thread, it is period of course, but it will also act in a way that cotton thread doesn’t do: it is more “ruff” so it grabs the fiber and prevents it from sliding. I normally use either 60/3 or 35/3 or 50/2 (All threads are constructed of multiple strands wound together, which gives them their strength. Linen threads are given two numbers, the first is a description of the thickness of the threads, the second how many there are. The lower the first number, the thicker the individual strands, and the more individual strands wound together, the stronger the overall thread). 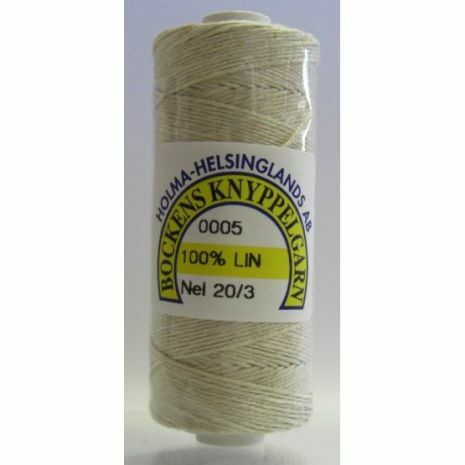 I buy mine thread from Kapitelhusgården (Sweden) or Pimp Your Garb (US) , and it seems like the Swedish brand ‘Bockens Linen Thread/ Bockens lintråd’ is the most common to find even here in the US. Bockens Linen Thread is also so well made that you don’t need to wax the thread before using it (and *tadaa* you save some time). The advantage you have when using linen thread is also that it will break easier than a cotton thread in the same thickness. This might seem a bit weird to read, but the other option is that you instead rip the fabric: and you can always re-sew the seam, but it is tricky to fix a ripped fabric. Besides linen thread, I also use silk thread when I need some extra strength (like button holes and lacing holes). I got an advice from someone a long time ago, that you always should try to sew with the same kind of fibers as your fabric, which is a good advice to have in mind. Though I use linen thread for both linen and wool fabric, since my experiment with sewing with wool thread was a disaster (it is way to weak for the seams so I hade to pratically redo the whole dress :), I use silk for silk fabric (like hemming a silk banner or a silk cloth) and standard polyester thread when I zick zacking modern brocade (it really just falls apart if you dont immediately take care of the edges). 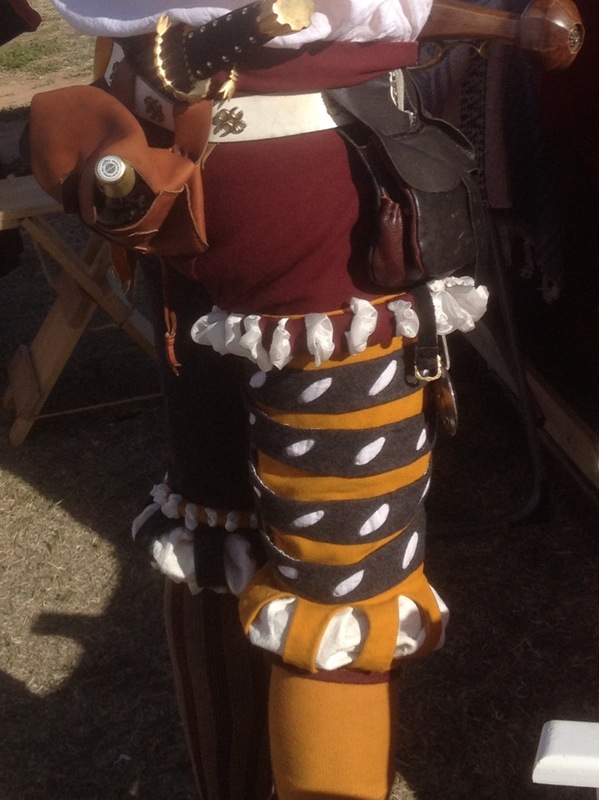 The pants are sewn with a neutral linen thread, and for those who are curious about how long time it took, so about 5-6 week. 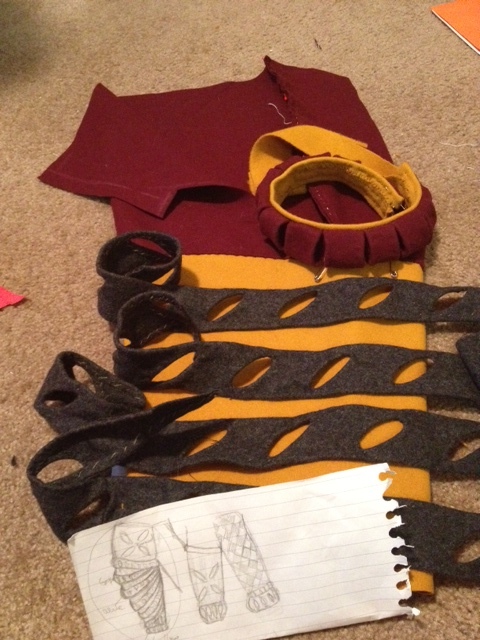 But then all the slashes are cut, folded and hand sewn (something about 200 slashes if I remember correct). 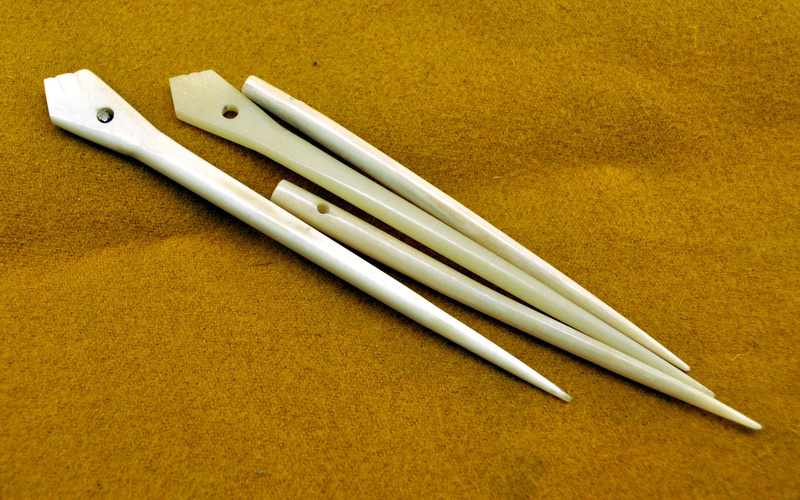 3) The awl is perfect to make holes with, stick it through your fabric carefully since you are supposed to go between the threads without destroying the fibers. 4) I use two kind of scissors (actually three kind since I also bought a special button hole scissor, but it is not really necessary since I kind of use my small one to cut button holes with anyway), one large scissor for cuttin fabric, and one small scissor for the handsewing. 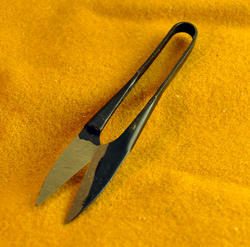 I really recommend to buy a good pair of scissors, and only to cut in fabric with to keep it sharp and easy to use. 5) Measurment tape is always nice to have, and it is even easier to have one with both inches and centimeters on the same tape, especially when you move from Swedens metric system to American inches. A tape with both will also help you transfering the measurements between the different systems, for example if you find a nice pattern from another country than your own. 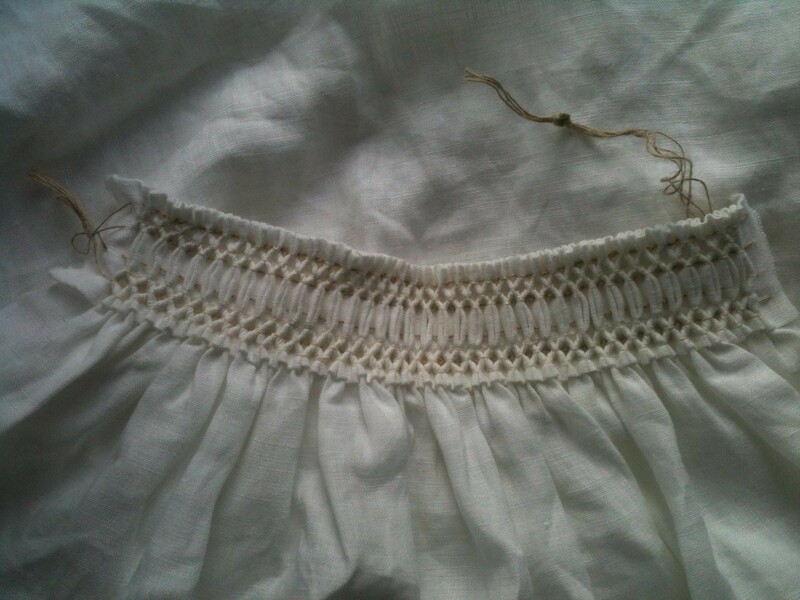 This entry was posted in Sewing and tagged Handsewing, hosen, linen thread, smocking, tools.